Tuning performed by db2tune8.sh script in the archive/Schema directory. FAStT200 Storage Server with 10x36.4GB 15K FC disks and EXP300 Stoage Expansion Unit with 7x18.2GB 15K Ultra 160 SCSI disks. See diagrams: db_tables.JPG and db_logs.JPG in the archive. Lifetime in Cache Mechanism. Only the data inside the bean was cached. transaction logs, message queues, and message logs. LVM striping that yielded 102400 MB of total disk storage for the database. WebSphere's workload management performed load balancing for RMI/IIOP requests. Site Selector balanced HTTP connections across the two IHS web servers. also maintained session affinity to a particular node. 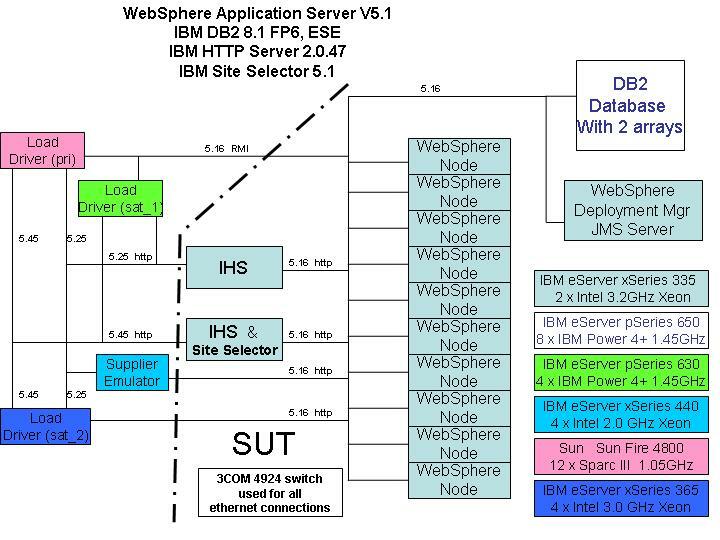 with WebSphere Application Server V5.1 in the IBM 1.4.1 JDK. The IBM DB2 Universal JDBC Driver (XA) is a type 2 driver.